We are proud to announce the launch of our new online resource, the Legal Atlas for Street Children. The Legal Atlas, produced in collaboration with Baker McKenzie with legal research from Baker McKenzie’s corporate partners, is an interactive map of the world which allows you to explore the legal landscape for street children. It features information on three legal subject areas: status offences, police round-ups and legal identity. The Legal Atlas website is informed by the United Nations’ official guidance on street children, which is called the General Comment on Children in Street Situations. This General Comment explains what countries should do in order to protect the rights of street children: how they can protect street children from harm, give them opportunities so that they don’t have to rely on the streets to survive, and help them to reach their full potential. Committing to equality in law is one of the four steps to equality for street children. By putting legal knowledge in the hands of advocates, policymakers, the media and the public, we can empower people to change the law and make a real difference to street children’s lives. The Legal Atlas was officially unveiled at a launch event hosted by Salesforce on 11 April. 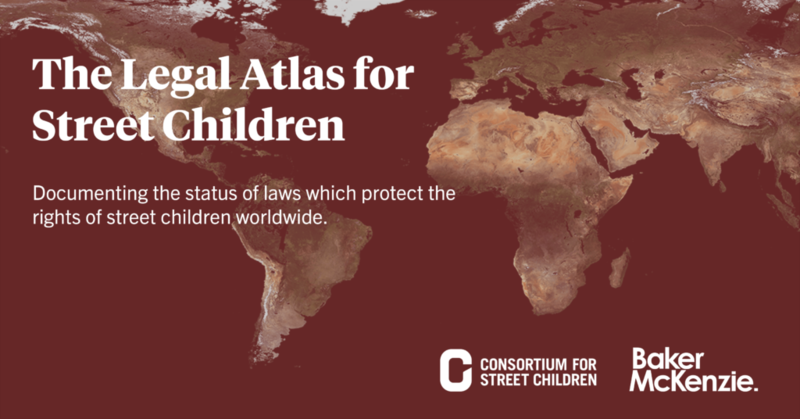 🡲 Click here to explore the Legal Atlas for Street Children!